This lightweight scarf or wrap crochets up quickly with a simple design and makes the perfect gift! 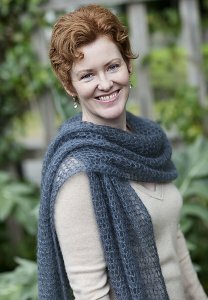 This pattern is from Churchmouse Classics- Kelly's Frothy Crocheted Scarf & Wrap. Size US P Crochet hook (or size needed to obtain gauge) is required but not included. Finished Measurements: Scarf- 10"X80", Wrap- 18"X90" after blocking. Colors Shown: Wrap- #639, Scarf- we recommend #582 as a close substitute. $14.95 -- Kit price including yarn only (no book or pattern).